Sacred to the memory of FERGUS SLOAN late farmer Garreyhorn who died 25th October 1842 aged 90. September 1806 aged 44. 1. Gilbert SLOAN was born about 1728. He died on September 16, 1777. He was a Farmer, Nockdon. He was buried in Kirkbride Churchyard #42. 4 iii. 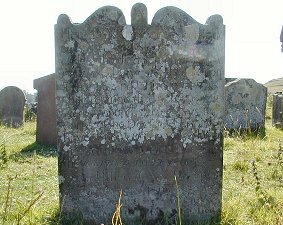 Thomas SLOAN was baptized on July 30, 1766 in Parish of Maybole, Ayrshire. 2 He died on February 16, 1767. He was buried in Kirkbride Churchyard #42. He has reference number Twin. 5 iv. John SLOAN was baptized on July 30, 1766 in Parish of Maybole, Ayrshire. 3 He died on February 16, 1767. He was buried in Kirkbride Churchyard #42. He has reference number Twin. SLOUAN. 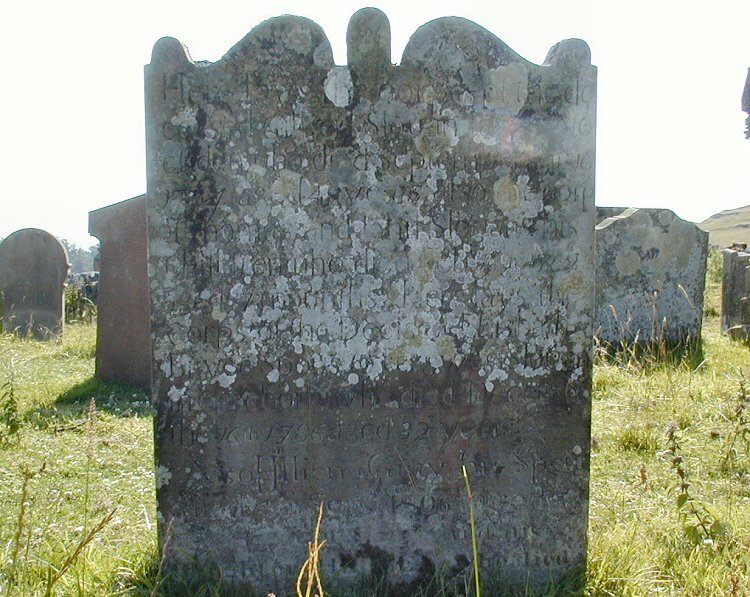 Also HILLIEN GRAY his spouse who died 30th September 1806 aged 44. 13 iii. Hellen SLOAN was born about 1796. 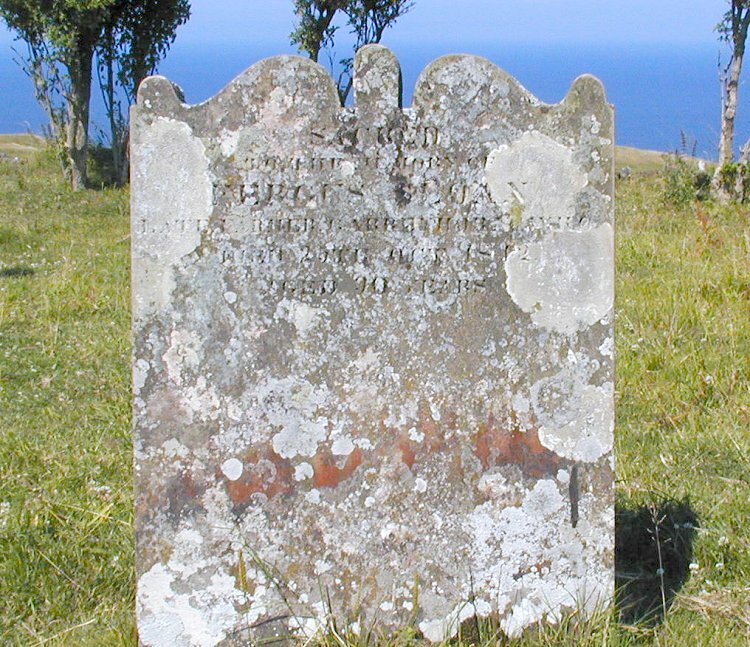 She died on February 25, 1823. She was buried in Kirkbride Churchyard #42. 1. Old Parish Registers of Maybole PAGE: Frame 193. 2. Old Parish Registers of Maybole PAGE: Frame 229. 3. Old Parish Registers of Maybole PAGE: Frame 229. 4. Old Parish Registers of Maybole PAGE: Frame 240. 5. Old Parish Registers of Maybole PAGE: Frame 255. 6. Old Parish Registers of Maybole PAGE: Frame 180. 7. Old Parish Registers of Maybole PAGE: Frame 290. 8. Old Parish Registers of Maybole PAGE: Frame 301. 9. Old Parish Registers of Maybole PAGE: Frame 327. 10. Old Parish Registers of Maybole PAGE: Frame 393. 11. Old Parish Registers of Maybole PAGE: Frame 404. 12. Old Parish Registers of Maybole PAGE: Frame 477.